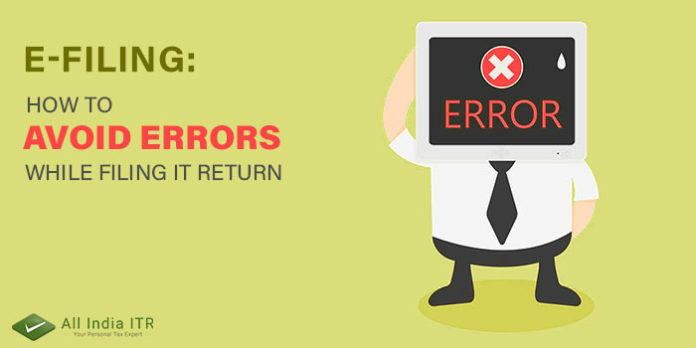 Let’s take a look at some of the most common errors that might occur when one files the IT return. Efiling of IT return is a lengthy process and many of us commit common mistakes while filing ITR. Here are some of the usual faults which are found in people’s Tax returns. Well, this is the most easily found error. Tiny details like name, address as written on the PAN card and Aadhaar card number are essential while Tax filing. A verification of the essential facts, including your name, address, the amount of tax, bank account details and other essential details. You must ensure that you avoid missing out on your tax credit or income tax refund. However, the Income Tax department gives you a chance to correct these mistakes by efiling a revised return. Using the inappropriate ITR form is one of the most common mistakes. So, choosing the right ITR form can be the primary step that you can take to solve your ITR problem. If a wrong form is filed then return will be considered invalid. The software will select the form on the basis of the data stored in the system. While efiling IT Return, you are asked to make a digital signature on the return. In case, you don’t have a digital signature, the government of India gives you the option to send duly signed ITR-V to the Centralized Processing Centre (CPC), Bangalore. The ITR-V must be sent within 120 days of the filing of return using ordinary- or speed-post only. You can also e-verify your Income Tax return online within 120 days of filing return. If you fail to do so, your return will be treated as Never Filed. Many people do not report about capital gains. They fail to disclose any profits earned from the sale of assets like property, gold or silver. Disclosure of everything while e-filing income tax is mandatory and must be done properly. One must identify and reveal if they have any long- and short-term capital gains. In case of capital gains, you must use ITR-2 instead of ITR-1. Previous articleWhy should I file ITR on Time?